It's still Mario's world. We're just along for the ride. Our review. Mario has been platforming and jumping on Goombas for over 30 years, so it's hard to imagine that he'd still have some new tricks under his cap. That's why he got himself a new one. But Super Mario Odyssey is more than just a 3D platformer with a gimmick. It's a celebration of Mario's rich history that also works to propel the series forward. It's a triumph for one of gaming's most beloved mascots, so much so that Shacknews needed some extra time to soak up everything the game had to offer. But now that it's finally break time, I'm happy to say that Super Mario Odyssey isn't just one of the best games of 2017, it's undoubtedly one of the best 3D Mario games ever made. The setup for Odyssey's story should look familiar to any video game fan. Bowser has kidnapped Peach and is ready to go all the way with her this time, forcing the Princess into a figurative shotgun wedding. 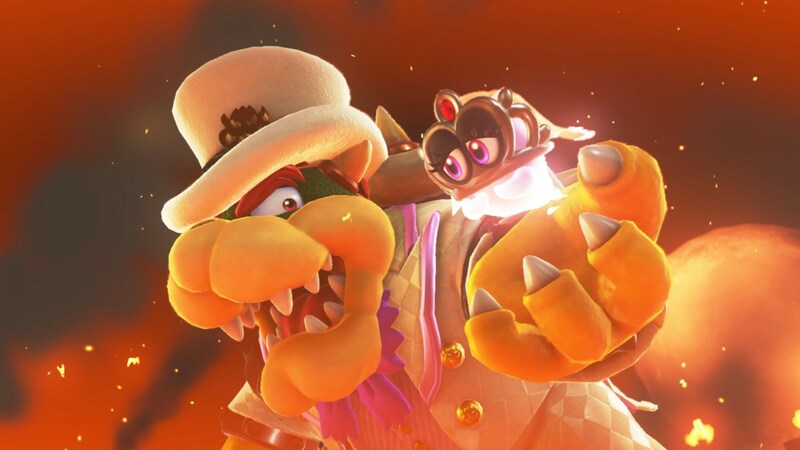 Bowser is able to defeat Mario easily with the help of his handy-dandy killer top hat, sending Mario down to the ground and on a new adventure. 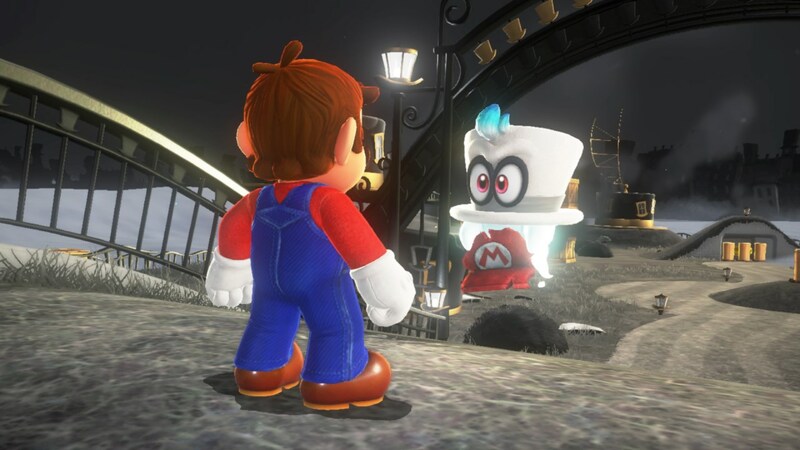 His companion is Cappy, a living piece of headgear from the Cap Kingdom, who's looking to save his sister, Tiara, who's currently on Peach's head. The two embark on adventure, opening the door to some of Mario's most interesting gameplay additions in years. Cappy's abilities are plentiful, allowing Mario to possess enemies and use them to solve puzzles, interact with other characters, and defeat bosses. These transformations offer new ways to explore stages, since each creature (or object) has their own distinct powers. For example, the T.rex can plow through walls. The Cheep Cheep can breathe underwater infinitely. The Hammer Bro can lob his signature hammers and chip away at softer walls. This mechanic alone makes Odyssey a pleasure to experience, since it encourages some outside-the-box thinking in solving puzzles and leads to some funny interactions with the game's characters. Even Cappy's non-capture abilities are simple to grasp, to a certain extent. The frisbee throw is immensely useful and one of the finest addition to a Mario arsenal in years. It also feels satisfying to finally master that cap-assisted long jump. The sole issue here is that there are certain moves that feel exclusively tied to motion controls, which feels somewhat counterintuitive given the Switch's design goal of being able to take games on the go. A great part of Odyssey's joy isn't so much that it has more Power Moons than you can shake a cap at. It's that they can be earned in a such a variety of ways that it keeps the action from feeling stale at any point. Many of the game's Power Moons are tied to uniquely different objectives, which can either test a player's platforming prowess, reflexes, swiftness, or cranial capability. There are even some that require finding the most coins possible, in order to pick up the proper outfit for certain situations. Odyssey's puzzle sections can truly be creative works of art, particularly the flat 2D sections. At first, they're simplistic, retro throwbacks to Mario's earliest NES efforts. However, as the game goes on, Odyssey finds ways to introduce twists. Some of the flat sections will circle around a 3D cylindrical structure, requiring some foresight into the dangers ahead. Other sections will see a chunk of the 2D background start scrolling, requiring Mario to keep up or he'll fall back into the 3D world and plunge off a cliff. The level design, in general, is an incredible treat, one that finally encourages exploration over standard linearity. One thing that's easy to notice is that for all of the intense action involved with defeating Bowser's minions, there are entire sections of the game dedicated to just exploring. 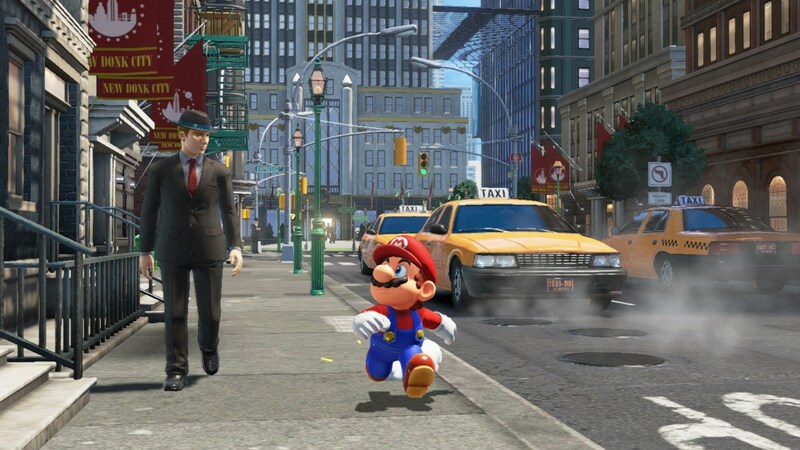 For example, beyond the sequence with the first Power Moon, the New Donk City surface is completely free of enemies. It's just a place to explore, try out advanced platforming skills, and work out puzzles. For every one of those sequences, there are other sections that rely on precision timing to defeat baddies and even some tense sections in which Mario tries to avoid killer dinosaurs. There's something for every type of platforming fan here, with the only minor nitpick I have being that the final battle with Bowser feels like it comes too soon. It feels a little crazy to beat the final boss and then realize that I'm less than 20 percent into the game's Power Moon total. Even at their absolute best, the old 3D Mario games have elements that haven't necessarily aged well. Odyssey feels like a game in which Mario's creators finally took a step back and made a conscious decision to slice out some of oldest gaming tropes from Mario's heyday. The lives system? It's finally a thing of the past. While I'll certainly miss the presence of the classic 1up Mushroom, times have changed and players don't want to feel arbitrarily bogged down by a dwindling lives system. This especially proves true during some of Odyssey's more difficult stretches. Instead of relying on lives, dying will simply reduce Mario's coin total by 10. While this feels like a relatively light penalty, as the game goes on and even into the post-Bowser content, the value of coins start to become more and more apparent. The completionist will come to realize that they need every coin they can get in order to collect everything, so with that in mind, losing coins for each death starts to feel like an appropriate penalty. Spawn placement feels much more forgiving, as opposed to past 3D Mario games. Dying no longer means having to start from the beginning of the level all the time or getting warped back to the hub stage. In fact, the whole concept of the hub world is out the window. Instead, Mario will either start where he was most previously or he'll start from the nearest checkpoint. Checkpoints are plentiful, which are invaluable for fast travel. Being able to warp from flag to flag is immensely helpful for anyone that wants to skip having to go through a harrowing platforming sequence a second time. It may feel like these are minor additions, but after years of 3D Mario games where I'd collect a Star or die just inches away from that star and get sent rocketing back into the hub world, these little things start to add up. It makes for a more streamlined, convenient, and ultimately better Mario experience. Super Mario Odyssey is an incredible game for any fan of the platforming genre. Even the biggest of novices will find something to love and ways to experience a bulk of the game. The seasoned Mario veterans will appreciate the refined formula, the carefully thought-out Power Moon placement, and the copious amounts of fan service. There's something to celebrate nearly every era of Mario, whether it's the aforementioned 2D sequences or the Crazy Cap outfits that span just about every era of Mario gaming and even a vast majority of Mario's side gigs. Given that Mario's held more odd jobs than Homer Simpson, it's amazing that Nintendo managed to not only remember them, but also pay tribute to them. It's been a long time since I've lost myself in a game to the point that its jaunty tunes are running through my head throughout the work day. Super Mario Odyssey has done that and will continue to do that for a long time. There's plenty to see on this journey, so book a one-way ticket and enjoy the ride. This review is based on a Nintendo Switch retail copy purchased by the reviewer. Super Mario Odyssey available in retail stores and the Nintendo eShop now for $59.99. The game is rated E.
Great review, it's quite the excellent game.